First, there are resources available and people to help you. There is much to learn but you are not alone. Children with hearing loss will thrive and develop when their families and other caregivers are aware of the impact of the hearing loss on learning and know what to do to support the baby’s development. You will care for your baby everyday – feeding, playing, bathing – during all of your care activities you can support your child’s language development and learning. The materials below are just a brief introduction. Contact your local early intervention program (ask your child’s doctor, audiologist or call your school district) to ask about getting help. One of the most helpful steps parents take is getting in touch with other parents who have learned the strategies for parenting a child with hearing loss and know the emotional ups and downs you may be feeling. Contact Hands & Voices, a parent-driven organization with many resources to support you immediately and in the future. Your state or region may have local a parent support network with people you could meet. Basic information! 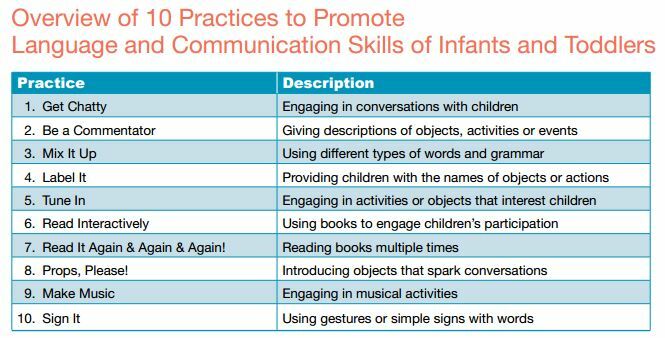 Language Unlocks Learning – A 3-page overview of what family’s need to keep in mind if they want to encourage their child to learn language at a rate similar to a child without hearing loss. It can help families identify if they are ‘doing the basics’ to help their child with hearing loss learn and develop. Talk to your early intervention teacher for more in depth information specific to your child. Checklist: Parent Interview Progress Report – A quick checklist that builds on the ideas presented in Language Unlocks Learning.